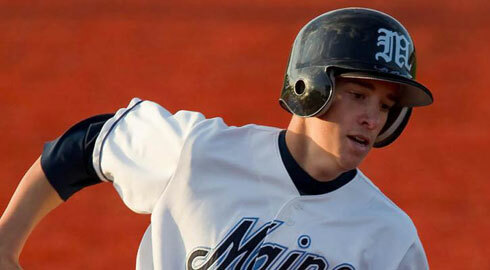 Several University of Maine baseball players have received honors lately. Four different Black Bears were named to the 2011 Rollins College Baseball Week All-Tournament Team, while Fran Whitten (Westborough, Mass.) was named the named the America East Rookie of the Week. Whitten hit .400 last week for the Black Bears (10-for-25) with two runs scored and four RBI. His 10 hits were tops in America East. Whitten had three doubles on the week and drew a pair of walks. He went 2-for-3 with a RBI in Maine's game at #5 Florida State. He also earned a spot on the Rollins College Baseball Week All-Tournament team after hitting .407 in seven games with four runs scored and a team-high seven RBI, including a pair of home runs. Taylor Lewis (Montville, Conn.) was named to the All-Tournament Team as an outfielder and was also named most valuable player. Lewis his .393 in seven games with a team-high 10 runs scored and six RBI. He had 11 hits, a pair of doubles and two home runs. He drew six walks and was a perfect 2-for-2 in stolen bases. Michael Fransoso (Portsmouth, N.H.) was named to the All-Tournament Team as a middle infielder. Fransoso saw action in all seven games in the tournament. He drew six walks and scored six runs for the Black Bears. He also drove in five runs for Maine. Jeffrey Gibbs (Toronto, Ontario) was named to the All-Tournament team as a pitcher. He finished 2-0 with a 2.92 earned run average. He pitched 12.1 innings and struck out a team-high 14 batters. The Black Bears return to action on Friday, March 18 when they travel to Rider for a four-game series. First pitch on Friday is scheduled for 3 PM.